"We are undoubtedly well on the recovery route. It's not a question of are we beginning it. I'd say it began at the beginning of this year and that's not just for Hovnanian, that's for the entire industry," Hovnanian said, noting that net sales orders for the 10 public homebuilders have increased 30 percent year over year. ... "That means we're all going to start building, which means we're going to be hiring, and that will boost employment and help strengthen the economy overall." This echoes something Warren Buffett said last year: "We will come back big time on employment when residential construction comes back. You will be surprised, in my view, how fast employment changes when that happens." As I wrote last week, we're currently building close to a million homes a year below what is needed to keep up with likely household formation. Each new home generates between two and three news jobs. Add it up -- it could have a big impact on unemployment. Simply put, the housing market is recovering. Not only are sales, margins, and backlogs improving, but the beginnings of a sense of visibility are coming back to underwriting land acquisitions and planning for the future. The homebuilding business is beginning to revert to normal, and that's positive for the U.S. economy in general, which is, in turn, good for a sustained recovery in the housing market. We're on offense and pursuing our growth targets. ... The housing market recovery is accelerating as inventory continues to decline and prices are now rising. We believe that many families who deferred the decision to purchase a home for several years are starting to move out of their rental units and look to buy a new home. In many markets, owning a home has a reduced cost when compared to renting. Given the passage of time, previous homeowners who had been kept out of the market due to credit issues are eligible for a mortgage again. These factors together with pent-up demand resulting from an unprecedented downturn in housing are driving a resurgence in the housing industry today. Meanwhile, the supply of for-sale homes has declined sharply, now at the lowest level since 2005. 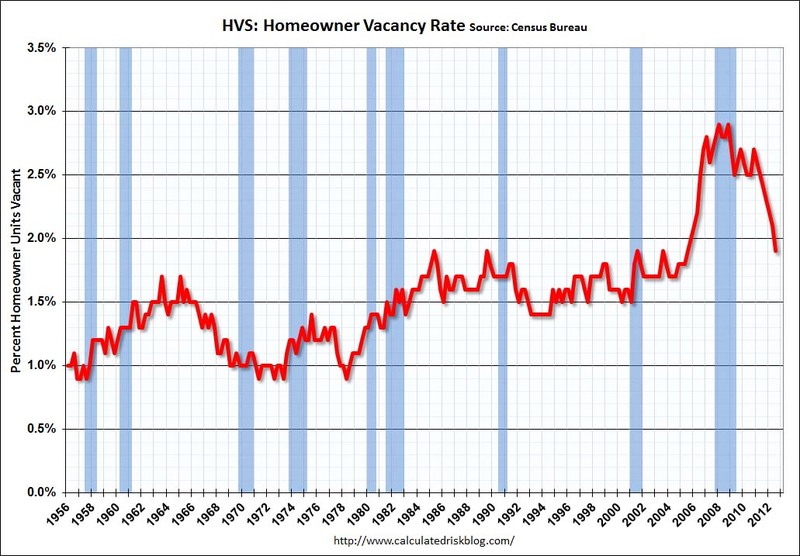 Home vacancies are at the lowest level since 2004. Last year, the House Budget Committee asked Ben Bernanke whether there was any historical precedent for an economic recovery without a strong housing market. "It's normal for housing and construction to be an important part of the recovery," he answered. No, in other words. Housing itself won't drive a strong recovery, but it's important enough that there hasn't been a strong economy without a strong housing market in modern history. 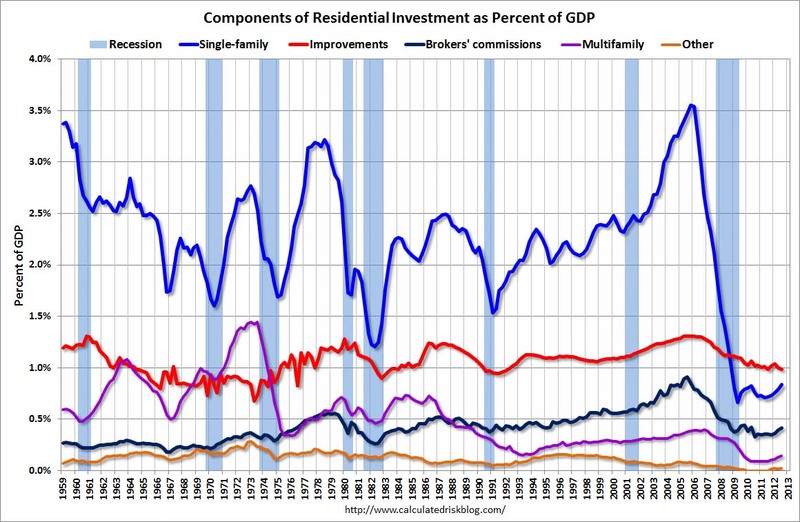 Residential construction has historically made up about 2% of GDP. It's currently less than 1%. That's the neat thing about this recovery: No one's calling for a new boom per se. Just returning to historic averages would be a big leap forward. What could go wrong? A new recession, which is likely if we go over the fiscal cliff, would set housing back. It's also possible that household formation patterns have shifted permanently, with fewer families being created as unemployed twentysomethings live with their parents. A quick housing rebound isn't guaranteed. But for the first time in six years, things are really, truly looking up. That's good news for the housing industry, and it's good news for the unemployed.